Thrifty and Frugal Living: Happy Veteran's Day & How You Can Donate Easily! Happy Veteran's Day & How You Can Donate Easily! 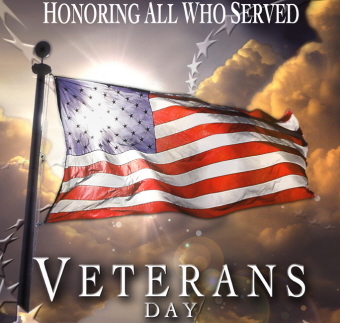 Happy Veteran's Day & Thank You to all the soldiers and their families for their sacrifices. If you are a Veteran, Soldier or Family Member then check out the list of Freebies that you can get today in your honor on Mojo Savings. If you are like me and do not have anyone close to you in the military, but you would like to donate; you have lots of options open to you. "In honor of Veterans Day, GourmetGiftBaskets.com would like to offer our valued customers a chance to give something special back to our troops. For every purchase made on 11/11/11 of $100 or more, we are going to donate one of our very special care packages to an injured soldier at Walter Reed Military Medical Center in Bethesda, Maryland, in time for the holiday season! We are also offering as a special gift to all of our customers, a coupon code, VET11, that is good for an 11% discount on any and all purchases made on November 11th." How amazing is that? So, you could knock out your Christmas Shopping (their gift baskets are really nice, read my reviews here and here) and donate to the troops for Veteran's Day all while saving 11%. Cool! *Review their selection of Christmas Gift Baskets on your Blog. *The topic of the Blog Post should discuss their Christmas gift selection and how they can be a great gift for someone. If you want to know about other companies that are helping out Veteran's, read this article in the New York Times.